Apple is reportedly investigating an issue with a number of Monster-branded headphones designed to use Apple's Remote and Mic technology. According to photo screenshots of an internal Apple service bulletin, headphones included on the extensive list do not meet Apple's technical specifications and can cause iPods and iPhones to play and pause erratically. 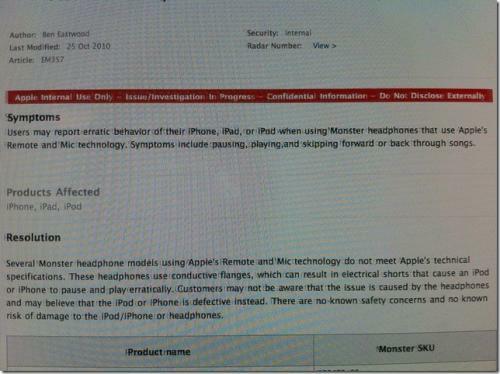 Several Monster headphone models using Apple's Remote and Mic technology do not meet Apple's technical specifications. These headphones use conductive flanges, which can result in electrical shorts that cause an iPod or iPhone to pause and play erratically. Customers may not be aware that the issue is caused by the headphones and may believe that the iPod or iPhone is defective instead. There are no known safety concerns and no known risk of damage to the iPod/iPhone or headphones. The list of nearly two dozen headphone models affected by the issue include representatives of Monster's Lil Jamz, Jamz, Turbine (Pro and Basic), and Heartbeats lines. The service bulletin does not appear to recommend a specific course of action for Apple representatives or the customers affected by the issue, but they should presumably contact Monster for support. Monster was recently made aware by Apple that some of our Jamz, Turbine and Heartbeats headphones with ControlTalk may experience some irregularities under certain circumstances (it does NOT affect ControlTalk Universal). This irregularity potentially affects a very small fraction of our headphones and to this date we have received no customer complaints. However, because the customer experience is our top priority, Monster immediately stopped shipment of all potentially affected products. With the exception of the black or chrome Heartbeats with ControlTalk, this issue does not affect any other of the Beats by Dr. Dre products. If you think you are experiencing a problem with one of the headphones listed below, please contact Monster customer service [http://www.monstercable.com/service] to receive a replacement. Potentially affected products include ControlTalk versions of Lil Jamz, Jamz, Turbine, Turbine Pro and Heartbeats. Monster is hyped up blah. In my opinion, Monster is over-hyped, over-priced mediocrity for people who want better stuff without knowing any better. I despise anything from Monster too. Their business practices are so horrible (ridiculous patent lawsuits and false advertising) that Engadget stopped posting any news related to the brand on their site. I use a lower end Sennheiser headset and it rivals many $$$ Megabuck models! Anything made by Monster is overpriced junk. Truly, nothing shows the power of advertising and branding like Monster when it comes to getting people to pay too much for so little. Monster Cables and products are nothing but overpriced garbage. Do yourself a favor and hit up www.monoprice.com if you want cables. My $5 set of HDMI is 50x better then any cheaply made monster cable. I used to purchase that crap years and years ago until I woke up and learned that their cables are junk. The ends come disconnected from the cables, they frey everywhere and they are just poorly made...not to mention OVERPRICED! Everyone, everywhere should completely ban Monster Products...lets put these scumbags out of business. Protip: Do some research on a site like Head-Fi before you buy your next pair of headphones. Curious how well Apple has documented this. Was thas a case of Monster reverse-engineering the inline connector protocol and guessing wrong in some instances? (For example, the logic for data on the 30-pin connectors is pretty convoluted based on what voltages do or don't exist on certain pinouts.) 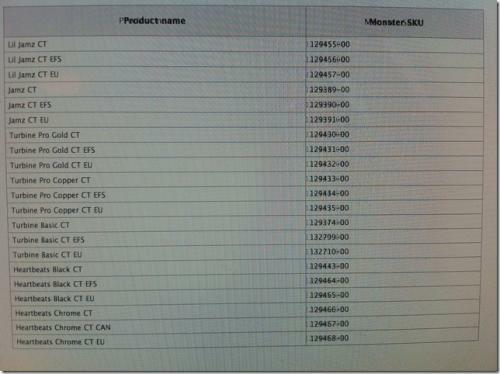 Or did Monster just fail to properly test a documented protocol?